Staples announced Thursday it would close 70 stores in 2017 after reporting fourth-quarter sales that were far weaker than analysts expected. The largest U.S. office-supply chain reported a $548 million loss and a 3% drop in sales in the fiscal fourth quarter that ended in January. Staples stock gave up 19 cents, or 2.1 percent, to $8.77 during morning trade, The Associated Press reported. A spokesman for the Framingham, Massachusetts-based company said those results prompted Staples’ decision to close 70 stores in 2017, or 4.5% of its 1,600 remaining locations as it works to overhaul operations. The latest store closings come on the heels of 48 shutterings last year, and a combined 242 in the two prior years. Staples had 1,255 U.S. stores and 304 Canadian locations. The retailer also operates some stores around the world. The retailer tried to merge with rival Office Depot, but that deal was blocked by the Federal Trade Commission a year ago. Traditional brick-and-mortar stores have been under pressure for some time due to greater competition from online outfits such as Amazon. 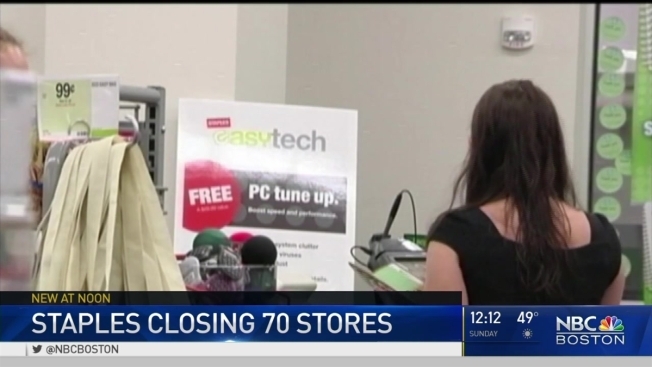 On Wednesday, RadioShack filed for bankruptcy for the second time in two years, announcing it would close 200 of its 1,500 stores and placing the future of the remaining stores in doubt.